A revocation of a recorded beneficiary deed must be lawfully executed and recorded during the owner's life or it has no effect. 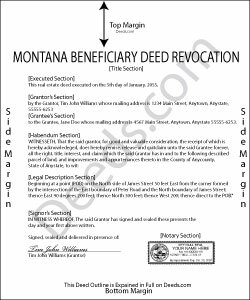 In 2007, the Montana Legislature enacted the state's beneficiary deed law, found at Montana Code Annotated Section 72-6-121. All following parenthetical references identify the part of that section which contains additional information. Beneficiary deeds are nontestamentary documents that convey a potential future interest in real property, but they only become effective when the owner dies (11). Until that point, the owner retains absolute title to, control over, and use of the property, including the freedom to modify or revoke the beneficiary designation, or to sell the property to someone else. This flexibility is what makes beneficiary deeds so useful; it allows the owners to respond quickly if circumstances change. Note that if the real property is owned as joint tenants with right of survivorship and if the revocation is not executed by all the owners, the revocation is not effective unless executed by the last surviving owner (6). If an owner executes and records more than one beneficiary deed concerning the same real property, the document recorded closest to the owner's death is the effective beneficiary deed (8). Even though the recording date directs the transfer, it makes sense to execute and record a revocation because it adds an endpoint to the original deed and helps to preserve a clear chain of title (ownership history). This is important because any perceived irregularities can add unnecessary complexity to future sales of the property. Revoking a beneficiary deed is a simple process, but it may not be appropriate in all cases. Contact an attorney with specific questions or for complex situations. John Y. said: Too much money for a form!